Duke LifePoint Hospital in Marquette, Michigan. For many contractors, whether general, electrical, HVAC, or mechanical, every now and then a project comes along and its impact trickles beyond the building’s future tenants. 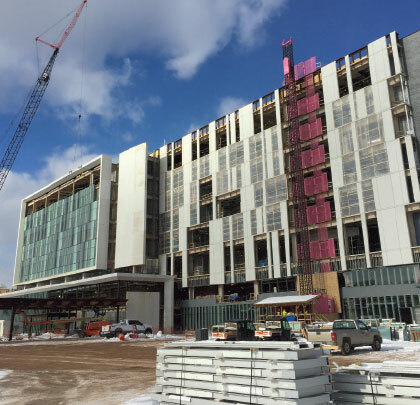 For the many crews working on UP Health System’s new hospital in Marquette, Michigan, this is that project. With more than 538,000 square feet of space across 11 floors and two buildings, and 4,000 individuals who will have worked on the project upon its completion, the construction of the new Duke LifePoint Hospital is making quite an impression on the relatively small community. Darren Muljo is the lead environmental safety and health manager on the project, representing Skanska Closner, the construction management company for the job. On a project where as many as 450 people can be operating at once, ensuring hazards are addressed, safety measures are in place, and proper equipment and protective gear are used is a tall order. But many, including Muljo and his team, operate like a well-oiled machine. Having the equipment on the site in working order so it’s ready when needed is necessary for productivity. But having the right equipment from the get-go is imperative for a safe and successful job. For HJ Martin and Son, the contractor installing the framing and drywall for the hospital, this rang especially true. A large portion of HJ Martin’s work is taking place in the facility’s 8-by-8-foot and 10-by-10-foot hospital rooms, which all have 9-foot ceiling heights. “Like everywhere else in the building, these areas need floor-to-ceiling framing and drywall. Using standard 19-foot lifts just isn’t an option,” Pecho says. On many jobsites, this is the point where extension ladders or stepladders come into play. But like many contractors who are starting to take a strong stance on preventing injuries from falls, Skanska Closner and HJ Martin employ a ladders-last mentality. That is, if there is a safer way to get work-at-height jobs done, then that approach must be used first, and only as a last resort should ladders be considered unless performed from podium or platform ladders. “We’re familiar with the ladders-last initiative and knew for these confined areas we needed to bring in more compact, maneuverable, and user-friendly options than the traditional 19-foot lifts,” Cuyler says. As Cuyler discussed this need with HJ Martin during the planning phase, he realized that while his fleet consists of a wide range of high-reach equipment, nothing ticked all the boxes for the drywall crew. In fact, the same challenge was facing other subcontractors on the project, as well. Hy-Brid Lifts offer a zero-turn radius and are small enough to easily maneuver around confined areas on jobsites, yet offer plenty of platform capacity for materials. Most importantly, however, is how they maintain safety on the jobsite. The lifts offer some of the industry’s lowest entry heights—one step as low as 20 inches. As installers get on and off the lifts, this low step up is more forgiving on joints than the two or three steps up onto taller platforms. Pecho’s crew of more than 95 installers has been using as many as 30 of the low-level lifts since October 2016, when their portion of the project began. 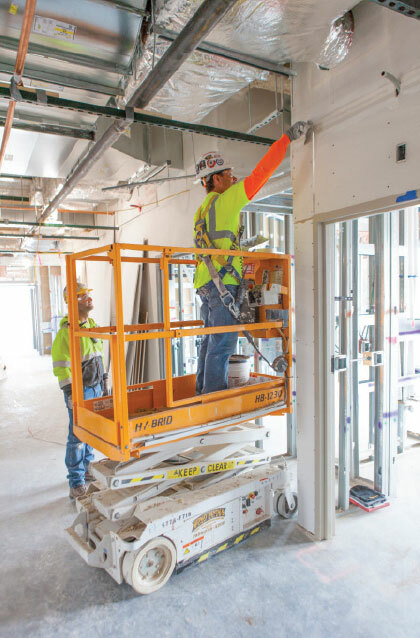 With a mix of both 12- and 14-foot units, the drywall installers are placing prefabricated sections of drywall and steel studs in patient rooms, bathrooms, and other small areas of the buildings. This includes 20-foot-long sections throughout the hallways, topped with standard 4-by-5-foot drywall. Without the lifts, installers would need to use ladders in the smaller rooms, which would mean stepping up and down as many as 15 times to fasten each sheet. Instead, installers can adjust the lift to the appropriate height and drive it to the next position when needed. The new Duke LifePoint Hospital project began in June of 2016 with the demolition of the city’s municipal services building and is scheduled to be completed during the fall of 2018. The campus will include an eight-story hospital, a three-story clinical services building, and a three-story, above-ground parking ramp. Walls and beams may be what will hold the new Duke LifePoint Hospital up for many years to come, but the true measures of the project’s success are already visible today. From the people who maintain the site’s strong safety culture to the equipment tasked with following that initiative through, the project is already fulfilling part of its future purpose—health and well-being. Custom Equipment LLC engineers and manufactures all-purpose Hy-Brid Lifts brand of scissor lifts in electric self-propelled and push-around models. The all-purpose lifts offer exceptional capabilities in a heavy-duty but lightweight design, are easy to maneuver and reach working heights as high as 20 feet. For more information, visit www.hybridlifts.com.